Only two blocks long, this is the smallest of Lynchburg’s seven historic districts. It is the only local historic district that is more notable because of the people who lived there rather than because of the architecture of the buildings. Pierce Street was first settled in the 1850s. During the Civil War, the area was the site of the Confederate Camp Davis which served as a military hospital as well as a gathering point for recruits from the state of Virginia. During Reconstruction, the abandoned barracks were converted to housing for Federal soldiers, a freedmen’s school, and a black Methodist church. The area was annexed into Lynchburg in 1870. By the 1880s Pierce Street included one of the first African American–owned grocery stores and a community center and was rapidly becoming a center of activity in the community. During the 20th century the people of Pierce Street served as a microcosm of the forces at work in Lynchburg and in the country. William J. Calloway purchased Camp Davis land in 1877 from William and Fannie Ford and built a neighborhood general store with living quarters upstairs for his wife, Rebecca Pride Calloway, and himself. The owners of the store and occupants of the upstairs apartments have evolved through the ensuing 150 years. The store was one of the first minority owned and operated stores in Lynchburg. In 1984 the vacant store was purchased by Chauncey E. Spencer from a descendant of his uncle, Warwick Spencer, Jr., and was stabilized. In 2009 the Spencer family began restoration of the store and upstairs apartments. • 1884 Newlyweds REBECCA and WILLIAM J. CALLOWAY lived over the store until they moved into a private home close by. • Circa 1910-1912 AMAZA LEE MEREDITH (1895-1984) spent several childhood years living above the store. The oldest of three children of Samuel Peter Meredith and Emma Kenney, Amaza was one of the nation’s first documented female African American architects. She received her Masters in Art from Columbia in 1934. She taught at Dunbar High School and later founded the Art Department at Virginia State University in Petersburg. Her home there, “Azurest South,” which she designed, is listed as a Virginia Historic Landmark. Amaza and her sister Maude Terry also founded the posh, all-black 120-lot development, “Azurest North,” at Sag Harbor, Long Island, N.Y.
• Circa 1910 OTA BENGA (1883-1916), was a Congolese Mbuti pygmy brought against his will to the United States and exhibited in a dehumanizing “human zoo” in both Saint Louis and New York. He was later relocated to the safety and security of Virginia Theological Seminary and College in Lynchburg. There he was tutored by poetess Anne Spencer and played with the Spencer children. His sadness over being separated from his own family in the Congo eventually overcame him and he took his life. For a short time around 1910, Ota Benga lived in an apartment over the store. Built by William J. Calloway and originally known as “Calloway Hall,” this was a gathering place for the community, and an outside market where farmers came to sell their produce and eggs. At one point Calloway altered the building to provide living quarters, and in the early 20th century the building was renovated as a church. The first congregation to occupy the building was Peaceful Baptist Church, and later, the still-active Wayside Gospel Temple Church of God took ownership. A noteworthy use of Calloway Hall was circa 1904-1910 when residents of the DORCHESTER HOME occupied the living quarters there. This “small scale old folks home” was organized under the leadership of AMELIA ELIZABETH PERRY PRIDE in 1897 and provided a place where ex-slave women could live, care for themselves, and spend their final years. The first donation in support of the home had come from a resident of Dorchester, Massachusetts and the name of the Dorchester Home Association honored that gift. Amelia Pride (1857-1932) taught in the Lynchburg Public Schools for 32 years, beginning in 1879, and also founded the MacKenzie Sewing School and the Theresa Pierce Cooking School for young black women. The Amelia Pride Homemaking Cottage, unique in the nation, was constructed in the 1940s at Dunbar High School by returning World War II veterans and was named in her honor. Principal of Dunbar High School for thirty years, C. W. Seay (1902–1982) created a program that demanded excellence and equality in the then-segregated high school. He put into place a curriculum, including a chapter of the National Honor Society, that had cultural advantages not usually offered in a segregated school. The result was a remarkable number of students pursuing a college education. His steady hand also guided Dunbar through the first years of desegregation. Dunbar High School was the academic and cultural center of the African American community in Lynchburg through much of the twentieth century. After retiring from the city schools in 1968, he joined the faculty at Lynchburg College and served two terms as Lynchburg’s first modern-day African American City Council member and first African American vice-mayor. He was president of the State Teachers Association and the first high school principal to serve as president of the Southern Association of Secondary Schools and Colleges. He lived on Pierce Street from 1951 to 1982. For more information Google Clarence W. Seay. Chauncey Edward Spencer, Sr. (1906–2002) retired to this home in 1977, across the street from where he was born. He was the third child of the poet Anne Spencer and her husband Edward. Spencer was an amateur aviator. In 1939 he made an historic flight with Dale White from Chicago to Washington, D. C. to lobby Congress on behalf of African American fliers. This flight resulted in bills providing for flight training for African Americans and their admission as pilots in the Army Air Corps in World War II. He was a founding member of the National Airmen’s Association of America which later became known as the Tuskegee Airmen. In 1948 he received the Exceptional Civilian Service Award, the highest award given to a civilian, for his service in World War II. His flight suit is included in the Black Wings exhibit at the Smithsonian Air and Space Museum in Washington, D.C. The home is now a Virginia Historic Landmark. Built in 1903 by Edward A. Spencer for his wife and their growing family, this modified Queen Anne style home is a Virginia Historic Landmark on the National Register of Historic Places. It is now a museum and is furnished almost entirely with the Spencer’s belongings. Most are pre-World War II vintage; some are Victorian. Edward Spencer was the first African American parcel postman in Lynchburg from 1912 to 1924. He was also a talented businessman who ran an organic chicken business, and was a notary, real estate developer, chauffeur, and a creative collector of cast-off building materials. These materials he re-used to great advantage in the home, as well as in building the garden and garden cottage, “Edankraal,” which were located behind the home. His wife, Anne, was a mother of three, the first librarian at Dunbar High School for 22 years (1923–1945), a poet, a gardener, a civil rights activist, and a friend and hostess to many notables. ANNE BETHEL BANNISTER SPENCER (1882–1975) was a lyric poet of the Harlem Renaissance period of the 1920s. She was the first Virginian and second African American to be included in the Norton Anthology of Modern Poetry. Over thirty of her poems were published during her lifetime, but all were written for her own pleasure, usually on Biblical or mythological themes or on Nature as reflected in her beloved garden. Her writings were discovered by James Weldon Johnson while he was a visitor in the Spencer home when he came to help organize the Lynchburg Chapter of the NAACP. This chapter was established in the living room of the Spencer home and is one of the oldest in existence. The Spencer home and beautiful garden were visited by many other notables of the period, including Langston Hughes, Countee Cullen, Georgia Douglas Johnson, Zora Neale Hurston, Claude McKay, Booker T. Washington, George Washington Carver, Sterling Brown, Paul Robeson, Marian Anderson, Adam Clayton Powell, Jr. and Dr. Martin Luther King, Jr. Another visitor, W. E. B. DuBois, gave the Spencers a cast iron head from Ghana. Anne called the head “Prince Ebo” after the Igbo (Ebo) tribe in Africa, and Edward installed it as a fountain on the edge of their garden pond. The charming garden cottage and the long, narrow garden behind the Spencer home were Anne’s retreat and source of inspiration. The sophisticated garden design evolved through the years and, in 1983, and again in 2008, was lovingly restored to its 1937 appearance by Hillside Garden Club, who continues its routine maintenance. This house was built by Warwick Spencer, Sr., who purchased Camp Davis land shortly after the Civil War. Warwick and Mary Susan Payne Spencer had eleven children. 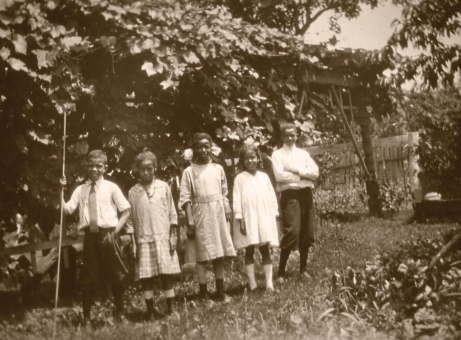 Four of the Spencer brothers­—Edward, Nelson, Charles, and Warwick, Jr., and a sister, Marietta, were lifetime residents of the neighborhood. Edward Spencer married the poet Anne Bethel Bannister (see 1313 Pierce Street). PROFESSOR FRANK TRIGG (1850–1933) was born into slavery in the Governor’s Mansion in Richmond, Virginia while his parents were personal servants of Governor John B. Floyd. At age 14 he lost an arm in a threshing machine accident which made working on a farm unsuitable. When the Civil War ended he enrolled in Hampton Institute where he became a close friend of Booker T. Washington. After a year’s study at Norwich Academy in Connecticut, Trigg began a career in education. In 1880, Trigg and his wife, Ellen, moved to Lynchburg where he taught for 22 years. He served as principal of the Polk Street and Payne Elementary Schools and of Jackson Street High School. Then he was named the first African American supervisor of black students in the Lynchburg public school system. He co-founded the all-black Virginia Teachers Association. He went on to become principal (president) of Princess Anne Academy in Maryland (now the University of Maryland Eastern Shore) in 1902, where there is a building, Trigg Hall, named in his honor. He returned to Lynchburg and in 1910 became principal (president) of the Virginia Collegiate and Industrial Institute. In 1916, he became president of Bennett College in Greensboro, N.C. In 1926, the Triggs retired to their Pierce Street home in Lynchburg where he died in 1933. ROBERT WALTER “WHIRLWIND” JOHNSON, M.D. (1899–1971), was a physician, avid tennis player and coach. From 1933, he spent most of his professional career at his home on Pierce Street where he built a clay tennis court and founded the Junior Development Program with support from the American Tennis Association. He recruited and hosted promising African American youth, many of whom lived in his home, and practiced and trained every day during the summers. Among them were Wimbledon champions Althea Gibson and Arthur Ashe. Many of the players he coached went on to college, with some receiving financial help from Dr. Johnson. He is credited with integrating tennis, but his most enduring legacy is instilling the highest standards of sportsmanship in the play of his students. In 2009, Dr. Johnson was inducted into the International Tennis Hall of Fame. Dr. Johnson received his nickname “Whirlwind” for his quickness on the football field at Lincoln College, where he was named an All-American. He received his medical training at Meharry Medical School and for many years practiced medicine from his office on Fifth Street. He was the first African American to earn staff privileges at Lynchburg General Hospital. His many medical contributions are recognized at the Johnson Health Center on Federal Street, which is named in his honor. During the period when most hotels did not accept African American guests, the Johnson home welcomed such notables as Duke Ellington, Lionel Hampton, Jackie Robinson, and Roy Campanella. Many friends and participants in the frequent tennis tournaments on the court assured that the Johnson home was a lively, social hub of the era. The Pierce Street Market was a traditional neighborhood grocery story since its construction in 1903 until it ceased operation in 1994. It was a well-known community landmark which operated under a variety of names, including Simmons Cash Store, Pierce Street Grocery, Rosser’s Market, and for one year in 1977, the Lickety Split Market. The store was constructed as a traditional neighborhood market, with a plate glass storefront on the first floor and a four room owner’s apartment above. Rebuilding Community, whose business is the preservation and economically viable renovation of historic houses, has restored the exterior of the building to its original appearance by re-opening the front porch utilizing its original spindle post supports and many of its other original materials. The interior has been reconfigured into two spacious apartments on each floor, combining modern conveniences with refurbished architectural features. Please help to support our efforts as we continue to dedicate Virginia Historical Markers each year during the Pierce Street Harlem Renaissance Festival. The 2014 Virginia Historical Marker dedication will be in honor of the history of the "Old Folks Home", and a Civil War hospital. Both were located near what was known as the Camp Davis area and today is located near Wayside Baptist Church.